Proxima Centauri lies in the constellation of Centaurus (the Centaur), just over four light-years from Earth. Image released Nov. 1, 2013. The star Proxima Centauri lies a scant 4 light-years from Earth, making it the closest stellar neighbor to our own sun and a perfect target for the Hubble Space Telescope. 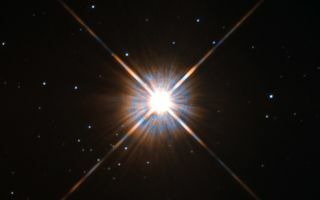 In this Hubble telescope photo, Proxima Centauri shines as a bright point-like object, but that appearance is deceiving. The star is actually invisible to the naked eye when viewed from the surface of Earth. "The convection processes not only trigger brilliant bursts of starlight but, combined with other factors, mean that Proxima Centauri is in for a very long life," NASA officials explained. "Astronomers predict that this star will remain middle-aged — or a "main sequence" star in astronomical terms — for another four trillion years, some 300 times the age of the current universe." Scientists currently estimate that the universe is about 13.8 billion years old. Scientists used the Hubble Space Telescope's Wide Field and Planetary Camera 2 (WFPC2) to capture the new view of Proxima Centauri. The image does not show the other two stars which make up a triple star system with Proxima Centauri. Its two companions, Alpha Centauri A and B, lie outside the frame. Hubble acquired the image in 1996, and NASA unveiled it in 2013. The Alpha Centauri star system is home to at least one alien planet, Alpha Centauri Bb, which orbits the B star. It is the closest known exoplanet to Earth. Follow us @Spacedotcom, Facebook or Google+. Original story on SPACE.com.